The Croatian Agency for Mobility and EU Programmes (Agencija za mobilnost i programe Europske unije) has published a brochure titled Horizon 2020 Success Stories in Croatia, which features two of our H2020 projects - EXCELLABUST and subCULTron! We are proud to have taken part in these successful projects and we invite you to take a look at the brochure and read about subCULTron and EXCELLABUST, as well as other stories about successful projects in our country. The study was presented to the representatives from the Ministry of Science and Education, the Ministry of Economy, Entrepreneurship and Crafts, the City of Zagreb, the Croatian Employers' Association, the Croatian Chamber of Commerce, the industry, the academic community and the support institutions from Zagreb, Osijek, Rijeka and Split. Professor Zoran Vukić and Nadir Kapetanović participated at 2018 IEEE OES Symposium held from 6th November until 9th November 2018 in Rectory Building, University of Porto, Portugal. On 7h November, Nadir Kapetanović presented the scientific paper named "Towards Enhancing the Navigational Accuracy of UUUs Through Collaboration of Multiple Heterogeneous". The authors of the paper are Kapetanović, Nadir (UNIZG-FER), Nađ, Đula (UNIZG-FER), Mišković, Nikola (UNIZG-FER), and Vukić, Zoran (UNIZG-FER). The OCEANS 2018 Charleston conference was held from 22-25th October 2018, bringing together 1,500 of the world’s leading marine professionals to network, collaborate, and learn about cutting-edge research, innovations, technologies, and applications in the marine technology and engineering fields. The member of CRIS team Petar Trslić took part in the conference Technical Sessions programme, presenting two papers: “Long-term, inspection class ROV deployment approach for remote monitoring and inspection” (main author Petar Trslić) and “Voxel map based collision detection for underwater manipulators” (main author Matija Rossi). Petar also used this occasion to promote the EXCELLABUST Marine Robotics database. We are looking forward to next OCEANS in Marseille from 17-20th of June 2019. The University of Limerick (UL) hosted the Open Days on the 18th and 19th October 2018. We had more than 12,000 visitors to our campus what was the biggest UL Open Days ever. The event aimed at prospective students, their parents, and teachers to learn about the UL experience, to become familiar with available courses, research facilities and to talk to the current students, lecturers and researchers. 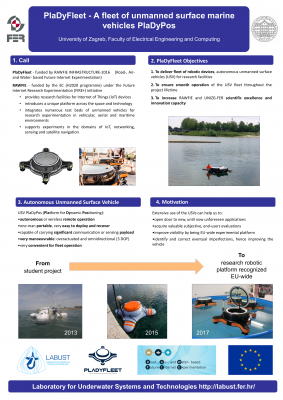 The CRIS team presented ongoing research activities, including the EXCELLABUST project, UL-made inspection class remote operated vehicle (I-ROV) designed for operations in challenging conditions, advanced human-machine interface (HMI) (mixed reality) for interaction with heterogeneous robotic vehicles, and real-time reconstruction of subsea structures. The next Open days will be held in January 2019. On Monday, June 11, 2018, the 3rd Innovation Management Training named “Creativity, Innovation, and Entrepreneurship” was held at University of Limerick, under H2020 project "EXCELLABUST - Excelling LABUST in marine robotics". This highly interactive training was held by Mr. Fergal Brophy who is an entrepreneurial specialist at UCD Innovation Academy. Besides this, he is a growth planner and the mentor at the Social Innovation Fund (SIF). LABUST members Zoran Vukić, Matej Celega, Milan Marković and Marin Bek successfully presented the H2O Robotics product H2Omni-X. Ivana Mikolić took part the in first public appearance of the EUMR project and Nikola Mišković presented EXCELLABUST activities. FIRST® LEGO® LEAGUE (FLL) is an international program that promotes the interest for the science and technology of youngsters between 10 and 16 years old. They are invited to have fun and get involved in technology through a yearly challenge robotics competition. In the contest, they will have to show their abilities to perform as a team, to innovate and to solve real problems of the society. This year the challenge was related to the water cycle. Girona edition (31st of January 2017) counted on 37 teams (around 350 students) and more than 100 volunteers. The event was a great success and 600+ attendees enjoyed it. More about FLL Girona. LABUST, as part of the University of Zagreb Faculty of Electrical Engineering and Computing, has signed bilateral project China Croatia Collaboration on Marine Robotic Systems - CC MARS with the Huazhong University of Science and Technology from China. The goal of this agreement is scientific exchange related to the design, modeling, and management of marine robot systems, especially ASVs. During this project, two international conferences on Maritime Robotic Vehicles will be jointly organized. This collaboration will enable, international exchange and transfer knowledge of the field, as well as link academic knowledge with the application needs. Furthermore, this collaborative project will build collaboration between the two laboratories, stimulate scientific exchange and initiate long-term bilateral relations between researchers in the field of intelligent marine systems. LABUST members Nikola Mišković (coordinator), Đula Nađ, Anja Babić and Nadir Kapetanović will participate in this project. LABUST is participating at University of Zagreb Fair 2017 as part of the Faculty of electrical engineering and computing (FER) among more than 30 faculties. University of Zagreb Fair 2017 has started today (23rd November) and it will last until 25th November 2017 in Zagreb, Croatia. The event is taking place at Student Center Zagreb. Our members Nadir Kapetanović and Matej Celega presenting current projects and collaborative projects with other groups from FER. Once again, we are expecting high attendance of high school students, young faculty students and other interested parties. This is a great opportunity to attract young people in world of science, particularly in robotics and underwater systems. Deputy head of LABUST assoc. prof. Nikola Mišković participated in Economic Conference Montenegro 2017 - “Challenges on the path to the European Union”. The conference took place in Hotel Splendid, Budva, Montenegro, from 2nd November until 3rd November 2017. The conference “Challenges on the path to the European Union” gathered around 500 representatives of governments, the business community, scientific and expert public from the Balkans and wider. The Conference has been organised by Chamber of Economy of Montenegro and Ministry of Science of Montenegro. It was opened by President to the Chamber of Commerce of Montenegro Velimir Miljušković, and as the panel guest, the conference was addressed by EBRD President Pierre Heilbronn. The University of Limerick (UL) has hosted an Open Days 2017 event on the 19th and 20th of October 2017. This two-day event allowed a number of visitors (prospective students, their parents and teachers) to learn about the UL experience, to become familiar with available courses, to visit research labs and to talk to the current students, lecturers and researchers. The MMRRC researchers presented ongoing research activities, including the EXCELLABUST project, and demonstrated the application of virtual reality (VR) headset as a user interaction interface to improve situation awareness during mission execution. Be part of exclusive marine robotics database and intensify your collaboration with other industry and research stakeholders. Croatian National Television (HRT) hosted our member Nikola Mišković in science show Prometej. He introduced wide Croatian audience with LABUST work and his successful career. Nikola talked about the importance of the latest researching results in underwater robotics, Horizon2020 subCULTron project in Venice, new cooperative systems and many more. On journalist’s question what it’s needed to do to keep young experts in Croatia, he answered that first of all it’s necessary to provide them with the environment in which they can show their excellence. He and many more experts from the Faculty of Electrical Engineering and Computing decided to stay because they have access to finance from EU, which allows them to work here in Croatia. UNIZG-FER LABUST members Nikola Mišković, Marin Bek and Milan Marković were presenting our spin-off project H2O Robotics on European Robotics League (ERL) Robots Major Tournament in Piombino, Italy. H2O Robotics is part of H2020 aPad project, which proposes the transformation of Autonomous Unmanned Marine Surface vehicle into commercially attractive, sustainable and innovative products that both address societal challenges and is highly competitive in global markets. UNIZG-FER LABUST is actual developer of the aPad, responsible for all project activities while Research Support Centre (CePI) participating in the development of the business plan and exploration of an exploitation path. ERL Emergency Robots Major Tournament 2017 was held from September 15th- 23rd in Piombino, Italy. ERL tournament is a civilian, outdoor robotics competition, with a focus on realistic, multi-domain emergency response scenarios. It’s open to the public and anyone interested can attend as a spectator. UNIZG-FER LABUST member Matej Celega participated at the 6th edition of the Festival of Science and Innovation "Trieste NEXT" on 21st - 23rd September 2017. The festival was held in Trieste, Italy, the European capital of science for the year 2020. LABUST member in collaboration with Maritime Technology Cluster FVG Scarl and ISSIA – Consiglio Nazionale delle Ricerche presented aPad, a product of a spin-off company H2O Robotics. 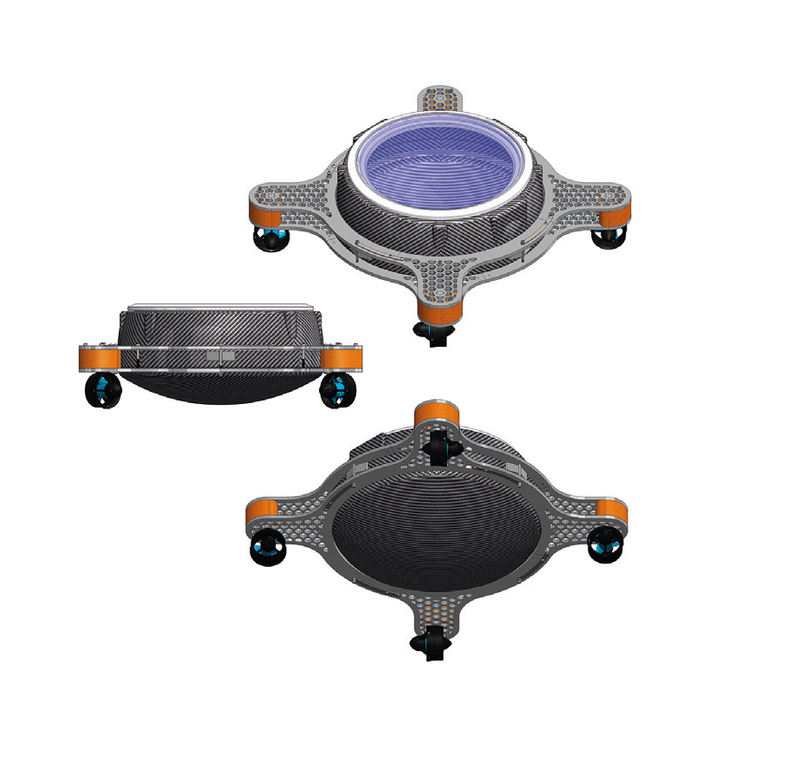 aPad a revolutionary multipurpose platform is a result of years of work and experience of the laboratories in various research and development scientific projects. International Field Workshop “Photogrammetry in Underwater Archaeological Research- Theory and Practice” will take place in Cultural Centre, Tkon, Croatia from 27-30 September 2017. The workshop is organized in the framework of the Croatian Science Foundation projects EXCELLABUST and AdriaS- (Archaeology of Adriatic Shipbuilding and Seafaring). The goals of the workshop are introducing the participants to the theory and practice of the photogrammetric photo and video recording, for the needs of underwater archaeological research, taking into consideration all its advantages and constraints. Our member prof. dr.sc Nikola Mišković is one of the workshop’s director, together with the main director dr.sc Kotaro Yamafune (A.P.P.A.R.A.T.U.S. Llc ) and prof. dr. sc Irena Radić Rossi of the University of Zadar. The main organizers are the University of Zadar, University of Zagreb Faculty of Electrical Engineering and Computing and A.P.P.A.R.A.T.U.S. Llc., Japan and Institute for Maritime Heritage ARS NAUTICA, Tkon, Croatia. UNIZG-FER LABUST members Marin Bek and Milan Marković will represent our spin-off project H2O Robotics on European Robotics League (ERL) Robots Major Tournament in Piombino, Italy next week. H2O Robotics is part of H2020 aPad project, which proposes transformation of Autonomous Unmanned Marine Surface vehicle into commercially attractive, sustainable and innovative products that both address societal challenges and is highly competitive in global markets. ERL Emergency Robots Major Tournamet 2017 in Piombino, Italy, September 15th-23rd is a civilian, outdoor robotics competition, with a focus on realistic, multi-domain emergency response scenarios. It’s open to the public and anyone interested can attend as spectator. Spectators do not need to register and the entrance is free. As a part of SeaFest 2017, UL research team (Daniel Toal, Edin Omerdić and Romano Capocci) attended a two-day Marine Trade Show, the Digital Ocean Conference and Our Ocean Wealth Summit at NUI Galway. The Marine Trade Show showcased some of the highly innovative products and services emerging from more than 60 companies and organisations across all sectors of the marine economy. The Digital Ocean – Ireland’s Marine Engineering and Technology Conference featured a selection of international marine technology companies, innovative Irish Small Medium Enterprises (SMEs) and Ireland's technology and research centres, focusing on specific opportunities for technology innovations to drive the global blue economy. Our Ocean Wealth Summit forms a key part of the Government’s integrated plan for Ireland’s marine sector, Harnessing Our Ocean Wealth, and brings together world renowned speakers, industry experts, business development agencies and the Irish business and marine research community for focused discussions on this year’s theme of ‘Rethinking Boundaries and Innovation for a Sustainable Marine Economy’. In addition to discussion about ongoing research activities and possible collaboration, UL team invited participants to register their institutions to EXCELLABUST Marine Robotics Database (http://excellabust.mmrrc.ul.ie). UNIZG-FER LABUST members Nadir Kapetanović and Đula Nađ participated in OCEANS '17 MTS/IEEE conference. Technical programme lasted for three days, from Tuesday, 20.6., until Thursday, 22.6. There were close to 40 exibitors showcasing their companies, as well as research laboratories and universities related to marine robotics research. As part of H2020 project "EXCELLABUST - Excelling LABUST in marine robotics", prof. Pere Ridao, dr.sc. Patryck Cieslak, Albert Palomer, and Dina Youakim held a tutorial titled "Intervention AUVs" on 17th - 18th May 2017 at the University of Girona. Topics of the tutorial were: direct and inverse robot manipulator kinematics, use of robotic manipulators attached to an underwater vehicle, motion planning and control of such systems. EMRA '17 Workshop on EU-funded Marine Robotics and Applications was organized at the University of Girona from May 15 to May 16, 2017, as a part of H2020 project "EXCELLABUST - Excelling LABUST in marine robotics". The goal of this workshop was to bring together academia and industry representatives from all around EU, who work in the field of marine robotics, so that they can present their work, exchange ideas, and discuss about the development of marine robotics in the future. As part of the expert visit within the H2020 project "EXCELLABUST - Excelling LABUST in marine robotics", Rafael Garcia and Dr. Ricard Campos from the VICOROB, University of Girona (Spain) gave a tutorial titled "Underwater Image Processing and Photomosaicing" on 11th - 13th April 2017 at the University of Zagreb Faculty of Electrical Engineering and Computing. LABUST presented itself at the Festival of Science, on April 28th, 2017 at the Technical Musem in Zagreb. Elementary and highschool students from Zagreb and many other cities of Croatia, who visited the event, had a chance to see and learn something about marine robotics and exploration of the underwater world. aPad, which is being developed by LABUST and partners, has been showcased as an example of a modular marine vehicle used for such purposes. The UdG team visited Ocean Business Southampton (UK), the second most important fair on underwater technologies in Europe. The fair was held from 4th to 7th April 2017 and it gathered more than 300 exhibitors with the latest innovation on the market. Attending to fairs like Ocean Business gives the partners of the EXCELLABUST project the chance to meet face to face with the leading European companies and institutions in Underwater robotics. The Drone & Tech Expo Ireland took place in Dublin, 10-12 March 2017. UL has spent those three exciting days showcasing their latest research and technologies, and meeting interesting and interested individuals and company representatives from Ireland and beyond. The Drone & Tech Expo, supported by the Unmanned Aircraft Association of Ireland (UAAI) and IAA, is not only one of the two main drone events in Ireland, but also the only one targeting both professionals and general public. The event only grew more popular after its first edition in 2016, which attracted over 50 exhibitors, and 2000 visitors. Both the drone community and the general public made this event a great success, and we are looking forward to the next edition! The Faculty of Electrical Engineering and Computing of the University of Zagreb, and Heron Robots have signed a Memorandum of Agreement. It was signed by the UNIZG FER Dean Professor Mislav Grgić, PhD and the CEO of Heron Robots, Professor Fabio Bonsignioro. The Memorandum was signed with the objective of promoting academic cooperation in education, research, and innovation, considering both agreement Parties’ common interests in academic, scientific, and cultural affairs. FIRST® LEGO® LEAGUE (FLL) is an international program that promotes the interest for the science and technology of youngsters between 10 and 16 years old. They are invited to have fun and get involved in technology through a yearly challenge robotics competition. In the contest, they will have to show their abilities to perform as a team, to innovate and to solve real problems of the society. This year the challenge was related to the collaboration between animals and humans for a better society. Girona edition (28th of January 2017) counted on 36 teams (around 300 students) and more than 100 volunteers. The event was a great success and 600+ attendees enjoyed it. More about FLL Girona. LABUST at University of Zagreb Fair for future students! Dr Edin Omerdić from the University of Limerick attended the 14th International Conference on Control, Automation, Robotics and Vision - ICARCV 2016. The conference took place in Phuket, Thailand from 13th till 15th November 2016. Edin presented a paper User Interface for Interaction with Heterogeneous Vehicles for Cyber-Physical Systems. ICARCV 2016 conference, organized by Nanyang Technological University and technically co-sponsored by IEEE Control Systems Society, was focused on both theory and applications, covering control, automation, robotics, vision and emerging technologies, including cyber-physical systems. The paper provides a brief overview of research activities about development of user interfaces for interaction with heterogeneous vehicles in smart cyber-physical systems. Dr Marc Carreras from the University of Girona attended the IEEE/OES Autonomous Underwater Vehicles (AUV) workshop in Tokyo (Japan) on November 6-9th, 2016. The presented work was entitled “Online motion planning for underwater inspection” and proposed the use of path planning algorithms for AUVs in applications where the robot needs to adapt online its trajectory for inspection or safety purposes. These algorithms generate trajectories under motion constraints, which can be followed without deviations, to ensure the safety even when passing close to obstacles. View planning algorithms are also combined to decide the movements to be executed to discover the unexplored seabed or target and to cover it with a camera or sonar. The workshop was attended for a wide international audience which presented other interesting advancements related to AUVs. Juan David Hernández from the University of Girona attended the IEEE/RSJ International Conference on Intelligent Robots and Systems (IROS 2016) in Daejeon (Korea) on October 9-14, 2016. The presented work was entitled “Planning Feasible and Safe Paths Online for Autonomous Underwater Vehicles in Unknown Environments”. It proposed an AUV framework for mapping unexplored environments while planning feasible paths. The presentation included simulation and in-water trials, which were conducted over natural and artificial marine environments. The proposed framework not only calculates paths that are more likely to be followed by an AUV, but also takes into consideration the risk associated with such paths. This allows the vehicle to safely navigate through the unexplored environment while moving close to nearby obstacles. The conference in which this work was presented is one of the most important events for the robotics community in the world. "Mission Planning", "Data Analysis" and "Girona500 deployment "
during the 1st EXCELLABUST summer school which was organized as part of Breaking the Surface 2016. Breaking the Surface 2016 was held from 2nd until 9th October in Biograd na Moru (Croatia) and more than 220 people participated in the program. The presentations are available in the repository here. "Thruster Control using LabVIEW Real-Time & FPGA Graphical Programming"
"Mission Planning" and "Data Analysis"
Dissemination of research is a must nowadays. Back in 2009, at the University of Girona and inspired in dissemination techniques of MIT, three professors of Computer Vision and Robotics Institute designed the R2B2 workshops. These 3-day workshops consist on building underwater robots out of recycled materials in a low cost basis. Teams of 3 to 5 students from 12 to 16 years old, conceive, design, build and test their own prototypes at the University. The workshops were held in March, April, May (two events) and July 2016. Since EXCELLABUST project started, 4 R2B2 underwater robot’s construction and water testing for youngster’s workshops have been done at the University of Girona. Around 50 students from different parts of the area of Catalonia, build 14 fully functional underwater robots at CIRS building. During June and July 2016, Nadir Kapetanović was a guest researcher at the National Research Council of Italy (CNR), Institute for research of intelligent systems for automation (ISSIA) where he was supervised by Massimo Caccia and Dr Marco Bibuli. The training was held on 18th July 2016 at CNR in Genova, Italy and attended by researchers and project managers from EXCELLABUST project partners' institutions. More about the speaker and the talk can be found in the detailed news content and here. Photos from the talk are avilable in our Gallery. Members of MMRRC UL research team participated in the MaREI Symposium held 5th - 6th May 2016 at National University of Ireland, Galway where they promoted EXCELLABUST project and its Breaking the Surface 2016 event. MaREI is a marine and energy-based research, development and innovation hub based in Ireland. The aim of Symposium was to showcase the breadth of research activity and to enhance collaboration between centres. Marco Bibuli from CNR attends 15th COMPIT! Marco Bibuli from CNR attended the International Conference on Computer Applications and Information Technology in the Maritime Industries - 15th COMPIT conference presenting robotics related research, development and results towards bridging the gap in the employment of advanced technologies in Maritime Industry. 15th COMPIT was held from 9th till 11th May 2016 in Lecce, Italy. UNIZG-FER project managers Mirjana Dozan, Ivana Mikolić and Mirjana Stjepanović participated in Excellence in Horizon 2020 proposal writing and project implementation training that was held 15 - 16 April 2016 in Opatija, Croatia. The training was held by European Training Academy. LABUST presents itself as part of robotics@FER at ERF2016! Alongside more than 520 exhibiting companies LABUST presented its project FP7 CADDY - Cognitive Autonomous Diving Buddy at the world's premier event for marine science and ocean technology Oceanology International which was held from 15 - 17 March in London, UK. Open door event at CNR for high school students! CNR has organized on 16th February 2016 an open door event for high school students. General description of CNR activities with respect to robotics related research and development, as well as hands-on demonstrations have been carried out. Furthermore, visits to CNR laboratories have been carried out. The EXCELLABUST project organized an open door event on 3rd February 2016 at the University of Zagreb Faculty of Electrical Engineering and Computing, in collaboration with JOBSTEM project. During the event, more than 120 students from elementary school "Tin Ujević" in Zagreb visited Laboratory for Underwater Systems and Technologies (LABUST) and were introduced to the area of marine robotics. The main goal of the visit was to promote STEM fields to children and thus motivate them to pursue education and careers in Science, Technology, Engineering and Mathematics fields. Daniel Toal, of the MMRRC at the University of Limerick, gave a talk during the 'Robotics in space, Underwater, Industry and the Law' event on the 2nd February 2016. The event was jointly organised Engineers Ireland, Mechanical and Manufacturing Division, and Institution of Mechanical Engineers. Daniel spoke of underwater systems and discussed the importance of remote presence as offshore operations are often prohibitively expensive and remotely controlled robots could be used for monitoring, repairing and maintaining the future of marine renewable energy farms. The agenda, lecture descriptions and materials used during the tutorial, are available in the repository. A short report is available in the detailed news content, while photos from the event are available in the gallery. given by Prof. Daniel Toal and Dr. Edin Omerdić, Mobile & Marine Robotics Research Centre, University of Limerick, (Ireland). The lecture will take place on Friday, 22nd January 2016, starting at 10:00 in Grey Hall at the Faculty of Electrical Engineering and Computing. OCEANS'15 Genova Conference & Exhibit was held from 18 - 21 May 2015 in Genova, Italy. Technological innovation is a key element of sustainable use of ocean resources, provision of ecosystem services, as well as long term economic growth. The MTS/IEEE Oceans series of Conferences promotes awareness, understanding, advancement, application and implication of marine technology.